The Virgin Islands, mountainous and glowing with greenery, are made up of about 100 islands, some of which are governed by Great Britain, and others by the United States. 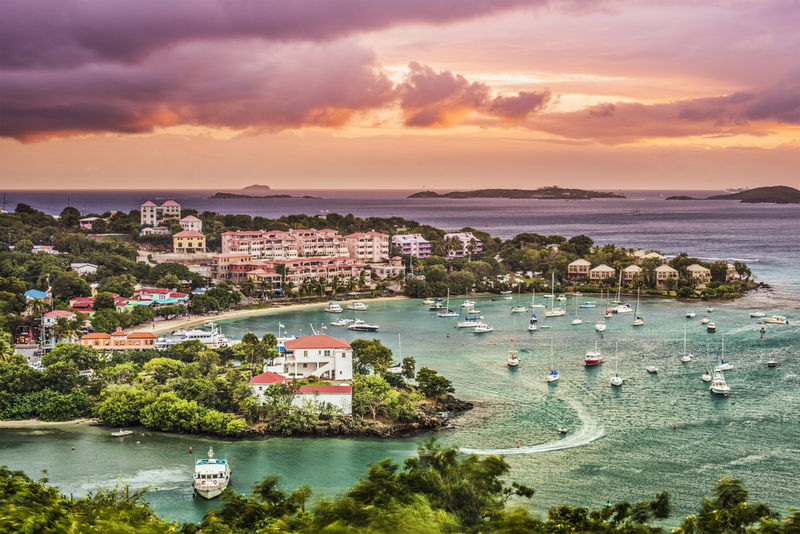 The most noticeable difference between the British and US Virgin Islands is that the British territories seem to have more of a laid-back attitude, whilst the US Virgin Islands have more hot spots for tourists. Out of the 100 islands, around 7 of them are major ones, whilst the rest, although more off the beaten track, have a greater sense of untouched beauty. St Thomas is one of the more cosmopolitan islands and attracts the most visitors, whilst St John has one of the top ten beaches in the world. Remember to complete all your shopping in St. Thomas before or after exploring the rest of the area. Yacht Haven Grande, the premier marina facility of the island, is also famous as one of the top shopping destinations in the U.S. Virgin Islands. It is home to a number of international brands, including a luxurious OROGOLD Cosmetics store. Although the peak season for the Virgin Islands is December to March, the best time to visit would be between April and June, as not only is the temperature milder with less rainfall, but accommodation prices are also usually much cheaper. When it comes to choosing where to stay, there is plenty of choice on the different islands, from luxury hotels to eco-friendly resorts. 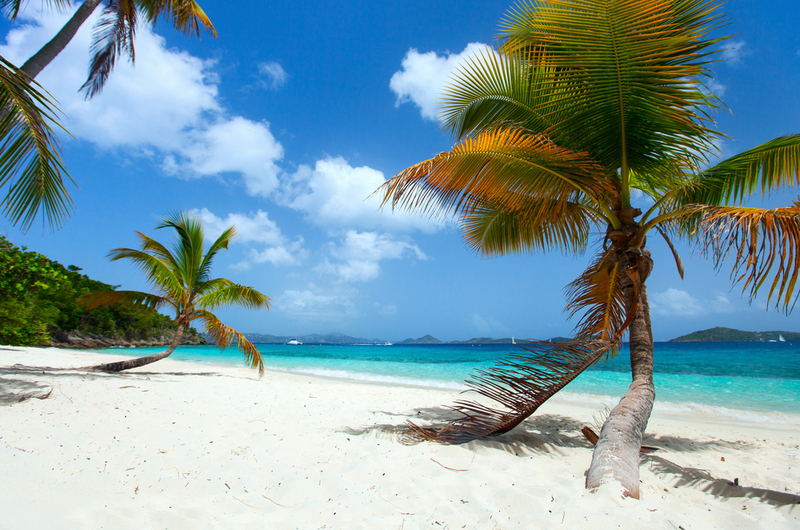 The Virgin Islands are known around the world for their amazing beaches and, the best thing about them, is that the public have the right to access every single one, even those owned by hotels. Trunk Bay on St John is one of the best beaches that you will find in the world, and is famous for hosting an underwater snorkeling trail. Sandy Point is the biggest beach whilst Savannah Bay is smaller and usually much more deserted, with a crescent of white sand and crystal clear water. Anegada, the most remote of the islands with just 200 residents, is a coral island, meaning that the whole island is a mostly undeveloped stretch of powdery sand. The Virgin Islands also has a rich history, and there are many historical sites you can visit to learn more about the different islands. The Annaberg Historic Trail on St John is a restored plantation where visitors can look around the slave quarters, whilst Fort Christiansvaern on St Croix is one of the most well-preserved forts of its kind in the West Indies, and its facade has not seen much change since the 1820s. For those who enjoy exploring the wonderland that lies beneath the surface of the water, the Virgin Islands offers great snorkeling and diving spots for both beginners as well as the more experienced. The British Virgin Islands, with their small caves and bays that were once hiding places for pirates, are the best islands to explore whilst sailing, as there is nothing better than having a gorgeous beach all to yourself. When it comes to local cuisine, West Indian food is generally bursting with flavor and spice, with conch chowder being a traditional favorite. The seafood is delightfully fresh, and the lobster and mahimahi are not to be missed. Callaloo, a native vegetable that is similar to spinach, is present in many dishes, but if you see callaloo soup on a menu, it has to be tried. Much of the produce is grown by local farmers, on the lush land that you will find all around you, so it is no surprise that each bite is as delectable as the last. With the ideal mix of Caribbean flair and West Indian culture, the Virgin Islands are the perfect place to visit for those who want a relaxing getaway with exquisite scenery, a rich history and tantalizing food. Whether you are flying in or arriving by boat, the bustling town of Charlotte Amalie will be one of the first sights that you see on the island of St. Thomas, the second largest of the US Virgin Islands. With a harbour that has been cultivated for over 300 years, St. Thomas is a thriving seaport, and, with the only airport in the Virgin Islands, it is the main transportation hub for visitors who want to further explore the area. With a steady flow of visitors, the renovated Danish warehouses that line the streets are now home to many fabulous shops and restaurants, and you will also find plenty of historical sights sprinkled throughout the island. From Fort Christian, built in 1672, to Bluebeard’s Tower, once home to the legendary pirate, to the oldest Synagogue in the Western hemisphere, there are many opportunities to soak up some local history and culture. Of course, St. Thomas is mostly renowned for its gorgeous sandy beaches, and no visit to the island would be complete without an exploration of some of its spectacular coastline. Magens Bay and its calm waters, as well as Brewers Bay with its white coral sand, are both popular with families, but can get rather crowded. Those seeking seclusion usually head to Secret Harbour on the East, with its swaying coconut palms, or to Hull Bay, which is popular with the surfers. The crystal clear waters also make for great water sport locations, from kayaking through mangrove lagoons to diving into the depths of the water to explore the marine life. Whether you are staying on the island, or using it as a base to fully explore the area, the beauty of St. Thomas will no doubt take your breath away.